The MRWA and Houghton Lake Lake Association (HLLA) partnered on this project to provide wild rice education, hold a wild rice collection day and support the Conservation Expo in Roscommon County. Funding for this project was from the Roscommon County Community Foundation, Wege Foundation, MRWA and HLLA. The Expo took place on September 13, 2008 where the MRWA distributed educational material to the public about wild rice and gave samples of parched wild rice, ready to be cooked. FSU professor, Scott Herron, and students collected wild rice in September. The volunteer wild rice collection day took place on October 3 at Martiny Lake (picture of wild rice below). 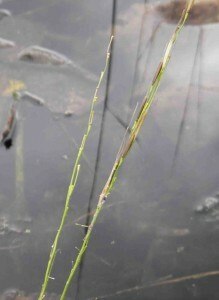 The wild rice that was gathered was planted in Houghton Lake. Newsletter and newspaper articles about the importance of wild rice were also written and distributed. The project was completed in March 2009 but the MRWA and HLLA will continue to provide wild rice education and help rehabilitate wild rice in Houghton Lake.